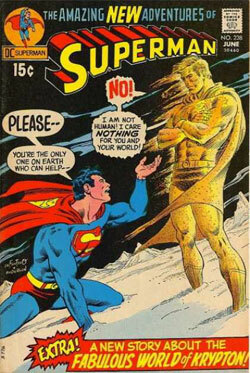 Back-Up Story: "A Name is Born"
Superman has not fully recovered from his encounter with the mysterious sand duplicate in the previous issue. In spite of this, he rushes to aid a ship attacked by modern day pirates. Once he's prevented a torpedo from hitting the ship's ruptured hull, the Man of Steel turns the criminals over to the Coast Guard only to find that the siege on the boat was a diversion. Terrorists have taken over Project Magma, a floating oil derrick on the ocean that has been modified to drill lava from under the Earth's surface to use it as an alternative fuel source. Superman leaps to stop the bandits, but hot, molten liquid is shot at him stopping him in his tracks. The Last Son of Krypton is able to free himself under the ocean once the rock cools. However, he is not powerful enough to stop the hijackers. Only one being can assist him - the strange double of the Man of Steel. Unfortunately, the creature refuses to help. The hostages aboard Project Magma and the entire world may very well be doomed. Lois Lane and Jimmy Olsen are in the Galaxy Broadcasting offices of the Daily Planet newspaper waiting for news of the situation at Project Magma. The leader of the terrorists is named Quig. He's demanding ten million dollars in gold and a hydrogen bomb. Should he not get what he wants, Quig will kill all the hostages. The explosive's power could be so powerful that it could split the planet in half. However, it is delivered with the riches the next morning as the world wonders what has happened to Superman. Among the people delivering Quig's goods to Project Magma is Lois. She may get more than a story if she meets the vicious Quig. Lois has caught the attention of Quig. While the hijacker's guard is down, the ace reporter takes his gun. Unfortunately, Quig seems to know that she won't shoot him. This forces the criminal to take serious action. He's going to kill Lois as a lesson to any of the other hostages. A man, whose face and body are hidden in his hat and coat, suddenly offers to take Lois' place. Quig refuses, but the person defends Miss Lane and the others. It is none other than Superman. He is using what powers he has to deal with most of Quig's men until the Magma Gun that had been fired at him is aimed at the hostages. The Man of Steel seems to have gotten the innocent people out of one danger only to get them into another one. Superman has regained his power of flight and has made short work of the man working the lava weapon. Desperate, Quig launches the H-bomb into the magma pocket. Determined to make certain that Earth doesn't suffer the same fate as Krypton, Superman dives into the hole. The Man of Steel takes the explosive from the one thousand degree Fahrenheit passage under the surface and hurls it into the air. Quig fires his gun at the approaching Kryptonian, but the bullets only irritate our hero. With Quig subdued, Superman catches the hydrogen weapon to dispose of it permanently. The world is once again safe thanks to Superman. Lois is questioning Superman once the hostages are safe. She cannot help but wonder why the Metropolis Marvel took so long to rescue everyone. He feels that the ace reporter must never know that Superman was unsure of himself. Now more than ever, the Man of Tomorrow is determined to return to full power or die trying. Story - 5: Admittedly, I felt that this issue was a little slow when I first read it, but it got better when I got to it the second time around. This is yet another great chapter to an overall excellent story. Though the duplicate itself seems to have only a cameo this time around, this is still an extremely important part of "The Sandman Saga." We see Superman recovering from the events of the last issue, and that helps to create more emotion and tension in the characters and story. Denny O'Neil also shows these points to be his strengths in his various Batman tales, and they also work well for Superman. This was yet another amazing Bronze Age comic book. Art - 5: The Swanderson team did it again. The visuals are superb. When the heck is DC going to come to their senses and put out an omnibus of their collaborations? I'll definitely buy one. Two teachers are preparing for the first day of school on Krypton. One is worried about how she'll keep her playful first level students in line. Her colleague tells her a story that he's told his classes many times. Before humanoid life existed on Krypton, it was surrounded by a crimson cocoon that would dissolve into the atmosphere many years later, turning the sky red. A hole had appeared in the covering that had allowed an explorer's starship to land on the surface. A mysterious being is watching as the pilot leaves the vessel. The two aliens greet each other. However, the actions of one of the individuals in space suits are taken as war-like. A battle ensues until one person is trapped in a red, suffocating syrup. The other saves the entangled one, and both remove their helmets while they make peace. The man introduces himself as Kryp, while the woman says that her name is Tonn. Seeing that his craft has sunk into the ruby-colored muck. Kryp realizes that he and Tonn will not be able to leave this new world. And thus, the name Krypton was born. Back-Up Story - 1: Rod Serling is turning over in his grave. Anyone that is a fan of the original Twilight Zone series is going to see that this story is basically a copy of "Probe Seven Over and Out." Cary Bates is a capable writer and could have done better tale without giving us something that had been done before. It's the worst back-up I've ever read. How Julie Schwartz approved this is beyond me. Skip this one, and watch the TZ DVDs instead, folks. You'll get more entertainment out of them than from this waste of paper. Back-Up Art - 5: The art reminds me of the old EC Comics' science fiction books. It doesn't help make the story better, but it is beautifully done. It's a pity that the writing wasn't as good as the images in this tale. Cover Art - 4: The image itself is beautiful and classic Carmine Infantino art. However, the big banner about the back-up story ruins it a bit. It might have been better to do a small blurb in the corner to tell readers about that. Otherwise, it's an awesome cover.